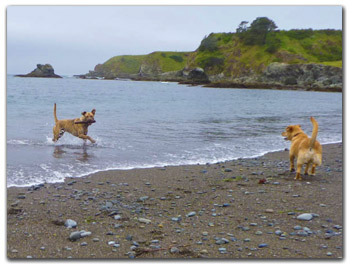 As most dog lovers know, California State Beaches require your dog to be on a leash at all times. But nothing makes a doggy happier than running on the beach, and they're OK to do that at this beach! They can run and play till they're all tuckered out! You've seen it, tongue hangin' out breathing hard, wet sandy belly and a smile from ear to ear! With that look in their eyes that says, "I love my human!!" It's a little tricky finding this beach; you need to turn East on North Harbor Drive and continue into the harbor, proceed to the end til it curves right and follow downhill into the harbor. Keep going around the hairpin, past the charter boats and restaurants. You're gonna go around a few bends and turns and keep going till you've passed under the bridge. Doggy beach goes all the way to the sand. Where a Dog can be a DOG!